One of the highlights of yesterday's grand reopening of Jaffna's Duraiappa stadium -- renovated with Inida's financial assistance - was a Yoga drill by thousands of schoolgirls from the Jaffna district. Below: Prime Minister Modi who inaugurated the stadium yesterday together with President Maithripala Sirisena via hi-tech teleconferencing facilities is seen here watching the opening ceremonies from his New Delhi office. President Maithripala Sirisena said yesterday that extremist groups were trying to give a wrong interpretation to the Indo-Lanka relationship at a time when the ties between the two countries were increasing. He was speaking after declaring open the newly renovated Alfred Duraiappah Stadium in Jaffna yesterday. 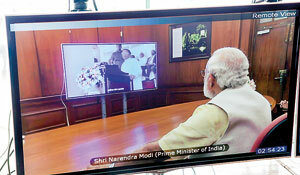 Indian Premier Narendra Modi took part in the opening by the way of a video conferencing. The stadium was renovated with financial assistance provided by the Indian Government. 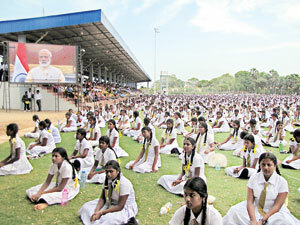 “The Indian Government has been extending its fullest cooperation for Sri Lanka’s development for a very long period. India also provided its fullest assistance to bring about a lasting peace in this country when a long-running war was ongoing’, President Sirisena said. “This renovation was done with financial assistance provided the Indian Government. The Indian Government provided its fullest cooperation to the renovation of this stadium. On behalf of the Sri Lankan Government and its people I extend my sincere gratitude to the Indian Prime Minister, the Indian Government and the Indian people for the assistance they gave”, he said. He said the occasion would strengthen the friendly relations between India and Sri Lanka. ‘Today is an important day for us as we are declaring open this stadium, while tomorrow is also an important day as it is Poson Full Moon Poya Day, which is an important event for Buddhists in Sri Lanka. It was from India that we received Buddhism. “The Indo-Sri Lanka friendship helped strengthen our economic, trade and international relations. We are fully committed to this friendship as the Sri Lankan Government;” he said. “Some extremist elements sometimes give wrong interpretations, but we have a very good understanding between our two countries. This is important for development and peace in the region”, he added. “I consider this stadium as a centre for reconciliation as in such a place, religion, language, race or caste are all immaterial. The renovation of the Alfred Duraiappah Stadium is an important step in the path to reconciliation. His killing was a blow to democracy,” he added. “After a wait of nearly 20 years, your applause and cheers will once again rekindle the soul of the Duraiappah Stadium. Even while we are sitting thousands of kilometres away in Delhi, we can feel the pulse of vibrancy and an atmosphere of change in Jaffna. “The Duraiappah Stadium is not just brick and mortar. It is a symbol of optimism and economic development – an arena of a prosperous and healthy future for Jaffna’s youth. It demonstrates your determination to shake the legacy of violence and pursue the path of economic progress. Its foundations are supported by your courage and great sacrifices. Its successful completion is a signal that you have left the path behind and are looking to the promise of a prosperous future”. “Excellency Sirisena, I also salute your visionary leadership and of Prime Minister Wickremesinghe, the Governor and Chief Minister of the Northern Province, in ensuring the success of this project,” he said. “India strongly believes that its economic growth must bring benefits to its neighbours. The Duraiappah Stadium embodies the spirit of our cooperation. Indeed, India’s support for Sri Lanka’s development is a promise of our friendship. That it will be based on your priorities and your needs is an assurance that you can rely on. This is what makes our enduring ties relevant to our present and also our future. Friends, India’s desire is to see an economically prosperous Sri Lanka – a Sri Lanka where unity and integrity, peace, harmony and security, and equal opportunity and dignity prevails throughout the country and among all its people. Esala Weerakoon, Sri Lanka’s High Commissioner to India was also present in New Delhi on the occasion.